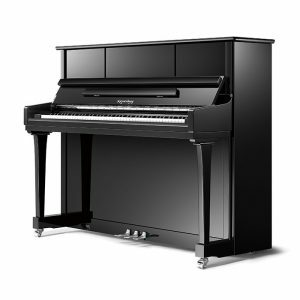 Kayserburg is the premium piano brand of Pearl River, the largest piano manufacturer in the world. 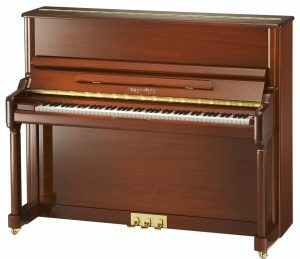 Kayserburg includes the hand built Artists series which compare favourably with the world leading piano brands. Kayserburg Artists establishes Pearl River, the World largest piano maker, able to challenge even the longest established European piano makers. Following over 60 years of piano making Pearl River have selected a small team of their most experienced piano makers to work in a traditional European style guild system. Hand crafting beautiful instruments under the watchful eye and individual quality inspection of a European master piano maker living in China. German Renner hammers are hand shaped to bring the finest tone from the German Roslau string wire, solid maple caped bridge and European Siberian solid Spruce hand selected soundboard. 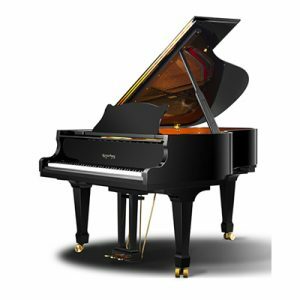 Kayserburg is the premium piano brand of Pearl River, the largest piano manufacturer in the world. The Kayserburg UH series has been created by a famed Swiss piano designer. The UH series incorporate many features usually found only in more expensive brands. With advanced design and high quality materials, the Kayserburg UH123 produces a warm, rounded tone and has a reliable and even keyboard touch. An excellent instrument for players at all levels. Specification includes a solid spruce tapered engineered soundboard, Renner hammers (Germany), Roslau steel strings (Germany), Hand-wound bass strings, Sand cast high quality pig-iron plate, Real ebony sharp keys and a child friendly slow close fallboard.